Race car driver, car collector, entrepreneur, founder and President of Precision Dynamics International AND Showtime Motorsports. These are just a few of the titles we could give Spectre Performance Team Driver, Ken Thwaits. Thwaits grew up in Wilmington, California, in the South Bay area of Los Angeles. As a young man Ken was attracted to racing with the dream of going pro in either Formula One or Indy. Admittedly though, he didn’t come from a family of means and that type of racing took money. A lot of money. Ken’s father, Rex Thwaits, raced in formula cars in SCCA during the 1960s and 1970s. Dad had gotten into racing after watching the movie Grand Prix and he encouraged Ken to get involved in motorsports. Following in dad’s footsteps, Ken began his racing career back in 1978 running a Formula Ford in SCCA amateur road racing events. In fact, dear old dad even supported his racing for the first two years, on a shoestring budget. By 1984, Ken had moved up to Pro Formula Mazda in 1984, and won the Pro Formula Mazda National Championship the following season. Ken told us back then the FM cars were a support class to the Indy cars at Long Beach. 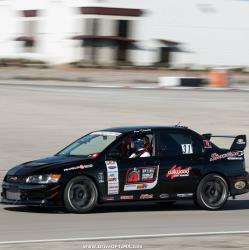 It was then that Ken went to Long Beach Grand Prix and was so blown away with what he was seeing he quickly signed up for instruction at the Jim Russell Racing School in Willow Springs in hopes of taking his driving skills to the next level. Thwaits then took a few years off before returning in the SCCA's Showroom Stock Class, running Camaros in that series until 1992. In 2014, after a 22 year long hiatus, Thwaits got back into racing when OPTIMA’s Search for the Ultimate Street Car series first began. 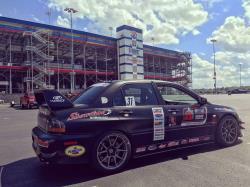 Ken took home top honors in his class in the opening season of this national series, earning him an invite to the 2014 OPTIMA Ultimate Street Car Invitational (OUSCI). And he's been racing with the series ever since! So how does a man come back to win after that much time off? Ken said, “I do my best to stay fit and eat and drink right. I really start to prepare mentally for a race 4 weeks before the weekend starts. I continually run each driving segment in my head and visualize winning. I spend a month thinking about winning. I meditate and pray every morning and give thanks for the life that I have. It is very difficult to beat the power of positivity!” He did what he called a driver modification. As a young driver he learned to run flat out when he needed to and to conserve the car when he needed to. He learned that driving expertise was achieved in levels. He also learned rather quickly that in the OPTIMA series to be on top, you’ve absolutely got to go fast right from the start. He knows his early training has helped him greatly in this series. 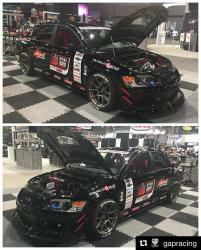 As for vehicle modifications he shared his extensive list with us on what changed for 2016 on his 2006 Mitsubishi Evo that was featured at the Wilwood Disc Brakes booth this year at the SEMA Show. Originally the EVO started out white and bone stock when they picked it up. They had wrapped the beast in satin black but received mixed results when it came to judging in the Lingenfelter Design & Engineering segment of the OPTIMA qualifying events, so they painted it! Engine mods included a larger turbo, stronger titanium internal assemblies, which in turn increased the power to 509hp, and added carbon drivelines. They did a complete suspension change in this car for the 2016 season. They installed JRi shocks, PAC springs, adjustable sway bars, and Wilwood big brakes. They also added a Spectre intake system. Then they added a Drenth sequential gearbox and Centerforce “DYAD” twin disc clutch. But the major modifications were in the Design and Engineering category. Mods included the exterior paint and color scheme change, then the significant leather upgrades to the interior seating and console, plus an incredible sound system upgrade. The engine compartment got a complete makeover with black & red powder coating and polished drip reservoirs. They’ve even relocated the battery to the trunk. Last but not least they’ve added a ton of carbon fiber! A carbon fiber trunk lid, plus carbon fiber skirts, front air dam, and rear wing. Just in case you were wondering these upgrades did indeed capture the D&E Judges attention and paid off in spades! Ken and his Showtime Motorsports team’s primary focus since returning to racing has been the OPTIMA Series. They ran all but 1 of the 10 races during the 2016 season and are pleased to say that every race they entered resulted in a podium finish culminating in a 2nd Place overall finish at OUSCI. But 2016 was extremely challenging for the Showtime Team. As we already mentioned, they ran 9 regular series races in OPTIMA Search for the Ultimate Street Car series plus OUSCI. Out of those 10 races they suffered 6 engine failures and 2 clutch failures, with one engine failure happening on day two of OUSCI. Ken hadn't been able to complete one full lap before losing power. The Showtime team kicked in to high gear and with the assistance of a fellow competitor, Ken was able to pull it off in the last minute. Turns out they really only had one race (Charlotte) where everything performed the way it was supposed to. However, Ken is a very positive and determined person and he refused to give up. So, they pushed on and in light of the challenges the 2nd place overall finish is extremely satisfying. Over time Ken has built Showtime Motorsports into a full working shop. 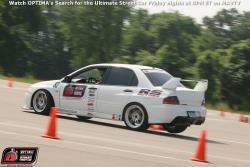 He has worked extensively with Raymond’s Performance in building, maintaining, and providing track support of the EVO. Ronnie Solomon of RS Motors handles all of the mods on the EVO, with JJ Furillo of Ultimate Performance responsible for the suspension development on the car. Thwaits, along with Showtime Motorsports, will continue to conduct their two charity events each year, a concert/auction for the homeless veterans and for Thwaits county's CASA program benefiting children in “at risk” homes. These events take place at the Thwaits Car Collection venue so that the attendee’s get a taste of the muscle car heritage. 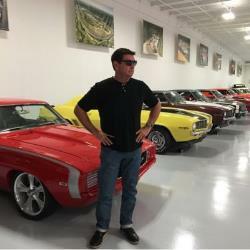 He will also continue to produce the video series chronicling the Showtime Motorsports racing and collector car world and continue to post it on social media. So far in 2016 Showtime Motorsports has produced almost 90 videos ranging from 15 seconds to over 20 minutes, and have just surpassed reaching 1 million viewers this year. He feels it is an incredible way of promoting the sponsors, the racing series, and his fellow racers. Inspired by Roger Penske, Ken notes that he admires Roger’s attention to detail and how he wins with class.